The Sani beach hotel has been newly refurbished to a luxurious contemporary style. All rooms are of a high standard with flat screen TV and outstanding views from your balcony or terrace. There are lots of activities and entertainment on sight and close by to make this a perfect holiday for everyone young and old. This was the best holiday ever! 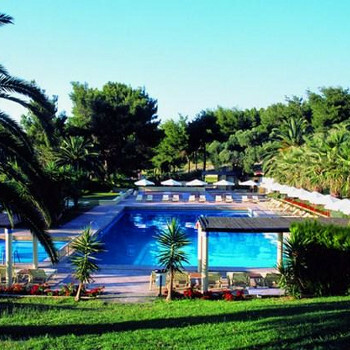 The hotel is very contemporary and all areas are beautifully maintained and very clean. The rooms are on the side of quite a steep incline but there are buggies to ferry you around the site if you just can't be bothered to walk at all! The food at all meals was really good and I can't think of anything that wasn't available. the restaurant was never crowded even on the busiest night and I didn't queue up for longer than 15 seconds to get something. There is a taverna on site which you can eat in at either lunch or dinner but reservations are taken for this. We had no problems getting a reservation even for the same evening and the setting is idyllic. All the tables are outside and the view of the sun going down was fantastic. At lunchtime apart from the restaurant in the main building, food can be got at the pool bar (sandwiches, salads etc) where there is a fairly limited menu. At the dunes restaurant by the sea, there is a more extensive menu which is really good. The food presentation and quality at both places was really good and much better than any other 4 or 5 star hotel I've visited previously. It is definately worth going all inclusive as the prices aren't cheap at all. Lunch alone with drinks for me, my husband and son always came to about 65 euros. That would be for one salad, 3 main courses and 2 drinks. The all inclusive package gives you all cocktails, wine and spirits. All the spirits we had were premium and not local. There was not any choice of beer in the price though except for the local Mythos. There is a dine around facility in the marina where the all inclusive guests could use an 8 euro for the adults or 4 euro for the kids, to use against the bill. Drinks are not supposed to be included but we didn't get charged once. We used the dine out once at the Macaroni Italian, but were disapointed as the quality and service at the beach club was so good it really made the Italian look very average. The staff were brilliant...always smiling and would bend over backwards to make the whole holiday a great experience without being over the top and in your face all the time! Entertainment in the evening was not great as there wasn't much that appealed to us, however on 3 of the nights there were really good dancers on in the outdoor ampitheatre. We would have liked to have seen more though. We will definately go again and would recommend this to families with young children and young couples who want a more relaxing than partying holiday. Definately no groups of singles anywhere to be seen.